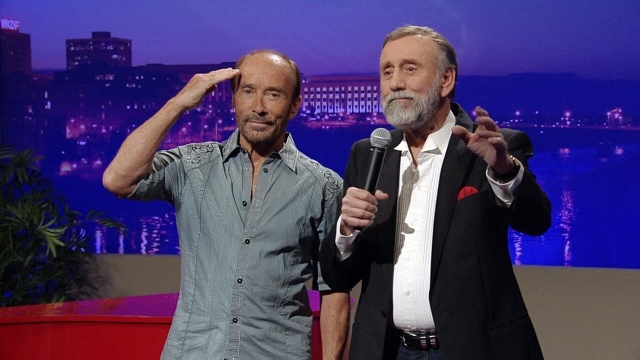 NASHVILLE, Tenn. (April 20, 2016) – America’s patriot Lee Greenwood, known for his top-charting mega anthem “God Bless The U.S.A.,” as well as numerous other country hits, will perform alongside the legendary Ray Stevens on “Ray Stevens’ Nashville” airing on RFD-TV on Saturday, April 23 at 8:30 p.m. ET. The patriotic episode will re-air Memorial Day weekend, Saturday, May 28. Visit rfdtv.com to find RFD-TV in your area. On Sunday, April 17, Greenwood performed at Bristol Motor Speedway for thousands of fans prior to the Food City 500 NASCAR race. Before he took the stage, he was surprised to bump in to football legend and recent Super Bowl 50 winning quarterback, Peyton Manning, at one of the driver’s meetings. Manning is an alumnus of the University of Tennessee – Greenwood’s favorite school for college sports. With seven No. 1 songs and 25 charted singles his hits include: “It Turns Me Inside Out”, “Ring On Her Finger Time on Her Hands”, ”She’s Lyin”, “I Don’t Mind the Thorns If You’re the Rose”, “Dixie Road”, “Somebody’s Gonna Love You”, “Going Going Gone”, “You Got A Good Love Comin”, “Fools Gold”, and “Mornin’ Ride,” Greenwood also celebrates several crossover hits including, “Touch & Go Crazy”, “IOU” and the duet with Barbara Mandrell, “To Me”. Lee Greenwood has also won numerous industry awards including: Male Vocalist of The Year from the Academy of Country Music Awards in 1983, two Male Vocalist of the Year Awards from the Country Music Association in 1983 and 1984, and a GRAMMY® Award for Top Male Vocal Performance in 1985 for “I.O.U.” He also won CMA Song of the Year in 1985 for “God Bless the USA,” which has been voted the most recognizable patriotic song in America. For more information on Lee Greenwood including details on his upcoming tour dates, please visit leegreenwood.com. Follow him on Twitter and Facebook!